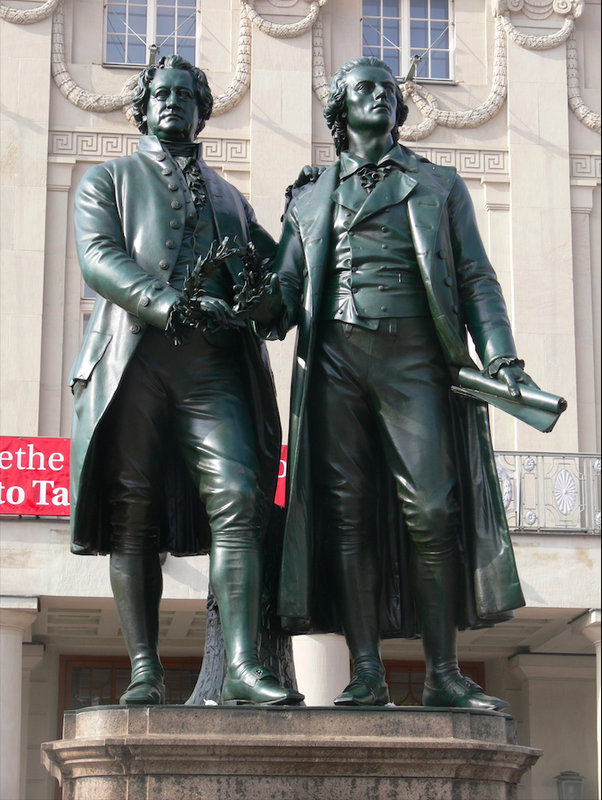 Johann Wolfgang von Goethe and Friedrich Schiller had a remarkable friendship and intellectual collaboration. In 1787, Schiller met Goethe in Weimar. With Goethe’s recommendation Schiller was appointed professor of history and philosophy in Jena in 1789. The letters that they have written to each other are of great literary and philosophical significance—these letters are not only a record of their friendship and their ideas, but also of their perspectives on important thinkers and intellectual trends in that period. That you agree with me in my ideas, and are satisfied with the manner of setting them forth, delights me not a little, and on the route I have entered will serve me as most needful encouragement. True, things that are expounded by pure reason, or at any rate profess to be so, stand firmly enough on internal and objective grounds, and carry within themselves the criterion of truth; but as yet there is no such philosophy, and mine is far distant from it. After all, the matter rests at last principally on the testimony of individual assertion, and needs therefore a subjective sanction, which only the concurrence of unprejudiced minds can bestow. Meyer's opinion is here significant and invaluable to me, and consoles me for the opposition of Herder, who it seems can never forgive me my Kantean belief. Nor do I expect from the opponents of the new Philosophy the toleration that is commonly extended to any system of which no better opinion is entertained; for the Kantean Philosophy itself exercises none in material points, and has by far too stern a character, for any compromise with it to be possible. But this does it honor in my eyes, for it shows that it will not permit arbitrary hypothesis. Nor, therefore, is such a philosophy to be dismissed with a shaking of the head. In the open, clear, accessible field of inquiry, it builds up its system, never seeks the shade, and makes no reservation of private feeling ; but, as it treats its neighbors, will it be treated by them, and is to be pardoned if it respects nothing but arguments. I am not at all alarmed by thinking, that the law of change, before which no human nor divine work finds favor, will overthrow the form of this Philosophy as well as every other : but this fate its foundations will not have to fear; for, since the human race was, it has been silently acknowledged and in the general conformed to, and this will continue so long as there is reason. Are you acquainted with the observations of Kant on the feeling of the Beautiful and Sublime of 1771? It would be a very clever work, if the words Beautiful and Sublime were not placed in the title, and occurred less frequently in the little book itself. It is full of delightful remarks on man, and one sees his principles already sprouting. You surely know it. What you write concerning the little work of Kant, I recollect to have experienced on reading it. Of the fundamental principles of the Beautiful nothing is learnt in it; but, as a natural history of the Sublime and Beautiful, it contains valuable matter. For so serious a subject, the style seemed to me to be somewhat too playful and flowery ; a singular fault in a Kant, which, however, is easily accounted for. I have been singularly taken by surprise here, by a small work of Kant, which you no doubt will know Proclamation of the Near Conclusion of a Treaty for Eternal Peace in Philosophy. A very valuable product of his well known way of thinking, which, like everything that comes from him, contains the most noble passages, but is also in composition and style more Kantish than Kant. It gives me great pleasure that the prominent philosophers, and the preachers of prejudice, could so vex him that he opposes them with all his power. I have also read Kant's small treatise, and, although it contains nothing strictly new, I have enjoyed his fine thoughts. There is in this old gentleman still something so youthful, what one might almost call aesthetic, if the monstrous form, which might be called a philosophical chancery style, did not embarrass one. It may be with Schlosser as you say, nevertheless his position in reference to the critical philosophers has something in it so doubtful, that it was not to be expected that he should be left out. Moreover, it seems to me, that in all disputes where supernaturalism is defended against reason by thinking heads, there is cause for imputing bad faith experience is altogether too old, and besides the thing is so intelligible. It is noteworthy that Goethe was not as attracted to Kant's philosophy as Schiller was. Goethe believed that the only starting point of philosophy is experience with reality and he was ambivalent about Kant's foray into transcendental conditions.